Post written by Barry Saide and Jasper Fox, Sr. The dictionary definition of reflection states that reflection is light bouncing off a flat plane and returning back at the same angle. This allows us to see an image clearly, like when looking in a mirror. Reflection is an almost perfect representation. If the light bends prior to it returning, it's called refraction. What was once a perfect view becomes hazy, the representation distorted. When applying these terms to education, how often do we reflect vs. refract? Reflecting on our own pedagogy and practice takes a confident mindset. We need to be secure with ourselves in order to be open to honest feedback from others, admit mistakes made during delivery of instruction, and self-identify possible solutions for why things didn't go as planned. Reflectors do not blame students for their inattentiveness or behavioral issues. They identify ways to maintain consistent engagement and involvement throughout the learning process. If many students do not get the correct answer, the default response of a reflective teacher is not to state: "I don't know why they didn't get it—I taught it!" Instead, the reflective teacher reviews their approach to teaching the concept, and will try a new approach the next day. Reflectors know not all students understand content delivered the first time because reflective teachers are lifelong students, and may not have grasped content presented to them at some point, too. A refractive educator doesn't quite see an accurate representation of a lesson that failed, or an interaction with a student that went poorly. Because the refractive educator only sees the situation through their lens, they will continue to view these (and other) educational experiences as unclear, muddled. When we ask refractive educators to reflect on things that occurred, their lens obscures how their involvement and approach were at fault. Instead the refractive educator faults students, their parents, the state of education today, and reminds anyone who will listen how well behaved they were as a student in school. How do we support our refractive peers in their growth toward reflection? Embarking on sustained and comprehensive professional development programs placed within the school schedule supports the refraction to reflection transition. Perpetual modeling reinforced by those with experience builds on this synergy. A successful example in practice is the "Class Labs" model, used successfully in the Swartz Creek School (SCS) District near Flint, Michigan. In this model, teachers (who have either volunteered or are chosen) host visiting teacher cohorts to observe them work with students. There is a robust pre- and post-observation protocol that focuses and encourages reflective thought. These sessions are not mandatory, but are well attended, because participants "come with a willingness to learn in a positive way," states Michele Corbat, Principal of Morrish Elementary in SCS. Since learning is made safe and judgements set aside, the singular shared importance of all participants is on improving practice so students benefit. Practical pre-observation suggestions include scheduling time with a colleague to observe in an informal manner and making sure to develop together an idea of what the observers are looking for, and determining protocol for during the observation session. During the class observation period, observers refrain from becoming participants (no interference or asking questions allowed). Instead, observers take notes to refer when conferring during post-observation with the lead teacher. Implementation "take aways" are brainstormed and agreed upon by both parties prior to the end of the conference. Considering important topics and writing them down, preferably online, is a powerful exercise to support the transition of refractive to reflective educator. "Every teacher researches every day," states Dean Shareski, lecturer at the University Of Regina. "What teachers don't do is actively and openly reflect on those findings. That's the shift I’m trying to help teachers make." Before the publish button is pressed, an extraordinary amount of thought and editing has occurred. During this polishing, the main tenets of the idea are tightened and refined moving the writer closer to their own understanding. The rest of the online community benefits from this process as they get to read the final copy which is a concise statement of purpose. Being a regular blogger takes commitment. Posting one piece a week is a good place to start. However frequently you decide to blog, the key is to make time on a regular basis. Once this is done consistently, writing becomes an opportunity to freely share reflections based on experiences. There are many free blogging platforms, such as Blogger, Wordpress, Weebly, Tumblr, and Rebelmouse. Choosing one is a matter of personal preference—the key is to write whenever you have an idea. Many bloggers have half a dozen posts in some stage of completion at any on time. Reading a wide variety of education blogs regularly exposes educators to new ideas and concepts. Transformational thinking occurs when conversations about these posts develop. New ideas that stem from blog posts provide alternate thoughts to consider. Engaging with the writer is one of the strongest benefits to blogging. In discussing commenting, William Chamberlain—blogging expert and #comments4kids hashtag creator—states, "A blog post is really an invitation to conversation." Meaningful conversation can be had around the post during which ideas can be fleshed out and developed in a fluid manner. Some may argue that reading and commenting on blogs is the most worthwhile reflective exercise. This can be accomplished in rather small chunks of time, by even viewing one or two blogs at a sitting. Tools like Feedly or Flipboard help organize the blogs you read and Twitter can be used to find new ones or get recommendations from your network. Writing thoughtful comments or questions that connect with the post promote further communication and enable both parties to reflect. One of the most important skills successful educators have is the ability to self-reflect. Expertise in contemplation transcends content and passion, setting the stage for continuous improvement. Evaluating one's practice allows educators of all levels to better serve students' needs. While there are more than the three methods above to support refractive educators, it is essential that the impetus for reflection is internal instead of external. To move from a refraction to reflection mindset, educators must be willing to admit that we all have room to improve and tomorrow's version of ourselves will be better than today's. ASCD Emerging Leader and a member of the Bill & Melinda Gates Foundation Teacher Advisory Council. Connect with Saide through his blog or on Twitter @barrykid1. Jasper Fox, Sr., teaches science at Copper Beech Middle School in the Lakeland Central School District in Shrub Oak, New York. Currently in his 12th year of teaching, Fox has developed a very successful classroom model focusing on student engagement that includes many transformative uses of technology and presented at prestigious events such as the National Forum For Middle Level Reform Annual Conference in Washington, D.C. Connect with Fox through his blog or on Twitter @jsprfox. A reflective learner looks at pieces of their professional history, including interactions with school community and learns to lead. Critical thinking and analysis reveals connections with 21st Century Learning. “Now, we have the problem of discovering the connection which actually exists within experience between the achievements of the past and the issues of the present ” (Dewey, 1938). Wow, what a thoughtful contribution! 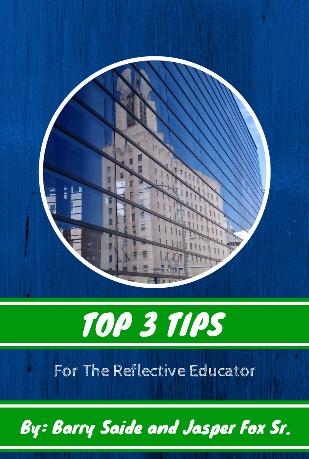 While we have all, at some point, chosen refraction versus true reflection, I appreciate how this post makes authentic and actionable suggestions on how to move closer to being consistently reflective. Additionally, though, it offers “open doors” for those who we know who are not yet there - the consistently refractive educators. I really enjoyed reading and reflecting on this post. It’s helping me consider some of my own goals as well as those for how I approach others in my school community. Love the suggestions you include in this post, and personally I hope we see more peer observations in our coming school year. I agree - writing and connecting are powerful tools in helping educators move from refractive to reflective practices. Your third piece of the pie is a natural fit. Thank you for posting during the summer when teachers are thinking back on their year, and planning ahead for the next.